It is always exciting to watch your dog respond to your instructions and return to you with enthusiasm, instead of walking over to someone else, chasing after another dog, or simply wandering off. To have this kind of bond with your pet, you must first build trust. A good way to do this is through off-leash dog training. You must consider the risks of off-leash training because no matter how hard we train our pets, there remains a risk of them running off and ending up right in the path of danger. They could get hurt due to an unexpected animal, sudden movement, or something else that may frighten them. Why should you train your dog to go off-leash at all then if there are so many risks? Dogs love to run and explore. Time spent without their leash helps them with physical and mental exercise, keeping them happy and healthy. Although off-leash safety cannot be fully guaranteed, it is possible to reduce the risks through adequate training. Unfortunately, on-leash training doesn’t help with building off-leash reliability. You must start instructing them without a leash so that they learn to respond and improve communication without the aid. Take baby steps from training inside your house to the backyard, and finally to a park. Incorporate off-leash lessons in daily play time and offer rewards for good behaviour. Additionally, including such exercises in your dog’s favourite activities will get their attention. Combining recall games with practice lessons is one way to train your dog. 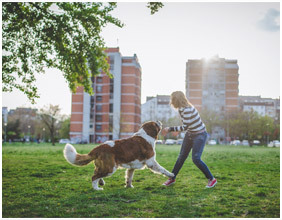 Back and forth recall, hide and seek, and fetching the ball are a few of the games you can play with them to make the experience fun and help you with off-leash training. To help your dog learn and respond to the commands when off leash, you may reward them with treats. However, repeatedly using the same item may turn out to be futile eventually as your pup may start weighing it against whatever it is that they’d rather be doing, like chasing squirrels. 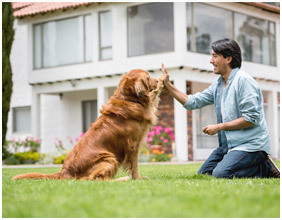 Listed below are a few rules that will help you sustain a reliable recall with your dog. Get your dog yourself or wait till they are ready to come instead of calling them to you at the end of play time. Let your dog know that following your commands will be worthwhile by rewarding them, and always reward your dog with their favourite things after a successful recall. ‘Hearing and obeying’ may be difficult for your dog when they are doing other activities like engaging with other dogs or playing with toys. Work on your timing and call them when you can see that they are not too into the activity. Determine what distracts your dog. Use high-value treats for difficult distractions. Make sure that your dog is aware that ‘staying connected’ involves two aspects; coming towards you when commanded and moving away when asked. You can use words such as ‘go’ and ‘back up’ to train them. Keeping your dog safe is an essential aspect of off-leash training. You can use words such as ‘leave it’ or ‘off’ to get them to drop any undesirable item that they may have picked up, and ‘down’ or a similar hand gesture to indicate that he should lie down. Also, ensure that your dog is quick enough to follow your commands when training for safety. Understand your dog’s limits and remember them when training off leash. For instance, if your dog fears loud thunder, chases cars, or can’t help but to greet strangers, you must handle such situations and decide when to set them off leash accordingly. If your dog is kept on a leash regularly, he may find it difficult to obey your commands because of the new-found freedom. You must strike a balance and allow them to romp around freely more often to get them accustomed to the feeling. You can have training sessions in parks, beaches, fenced playgrounds, and trails where your dog will be safe. If you’d like, you can also look into getting the help of a professional to train your dog when off leash. To enroll your pet in our Off-Leash Dog Training, feel free to reach out to us at Alpha Paws by calling 1-877-868-5248 (PAWS). We will teach your dog to perform all the necessary commands when off leash.